The four want to make some easy money without much hard work. In Part – 1 they had struck gold as they got hold of a wealthy businessman’s cash but ended up donating it all to charity. And Part – 2 begins from where Part – 1 ended as the four are again on the road. Seeing Sanjay Dutt enjoy the life of a wealthy businessman they are ready to do anything to become his partners. 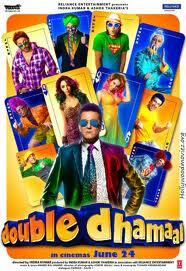 And thus begins the “Double Dhamaal”. He has Kangana Ranaut and Mallika Sherawat for company to take the four on a ride. The movie disappoints on every count that I can’t understand how to begin. The script is filled with mindless and slapstick humour which doesn’t evoke any laughs after a point in time. The sexual innuendoes like “Blow of the Job” make you cringe on seat wondering what was the script writer thinking. There is nothing in the name of a story or a plot. Scenes like the gorilla one have been repeated to death over the years in countless flicks. With every passing sequence you wonder whether “Dhamaal” was made eons ago. The lesser said about the performances the better. It seems as though everyone was paid to ham to glory. The ladies are mere confetti just to increase some glamour factor. But Mallika’s bikini act and “Jalebi Bai” isn’t enough to save the day. The music is nothing much to talk about as none of them are chartbusting tracks. “Chal Kudiye” and “Jalebi Bai” may be peppy to some extent but won’t last too long. How come suddenly we can’t tolerate corruption? Dear Aseem, a really nice review. I like the honesty with which you’ve written the review. I don’t watch the films but I love to read the review. Your review has convinced me that by not watching Hindi films I am not missing out on anything. Thanks for such a brilliant reivew.